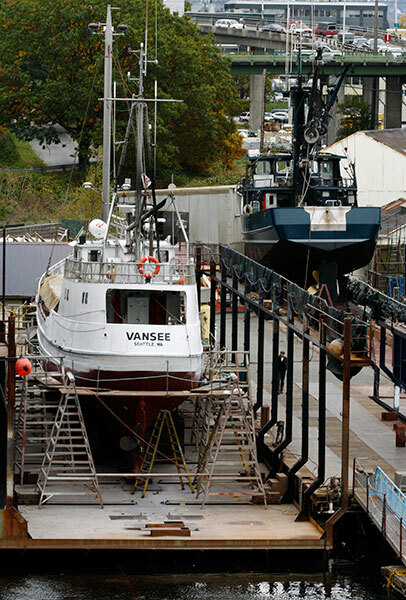 This Gallery features photographs of boats shot around the Seattle Fishermen’s Terminal and moorings across Salmon Bay on the Ballard shoreline. 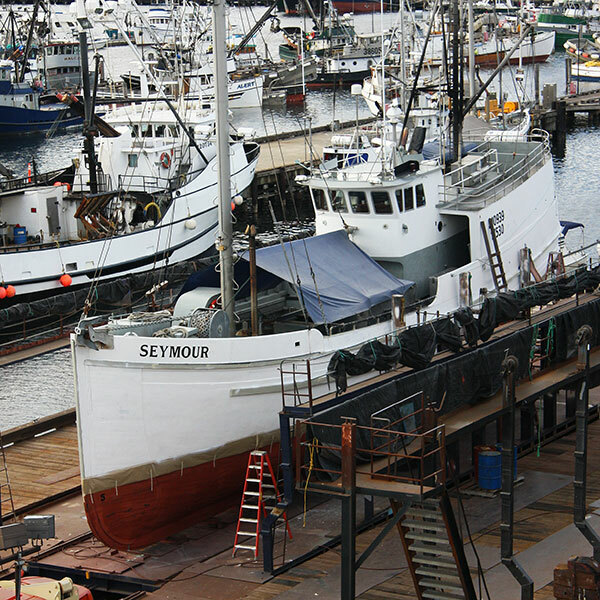 The Terminal is home to commercial fishing fleet boats operating west into the Pacific including the coast of Alaska. In 1917 and after long development, the Washington Ship canal linked easterly Lakes Union and Washington to Salmon bay and through the Hiram M. Chittenden Locks to the open sea. A ship repair yard is set in the Terminal alongside the Ballard Bridge. 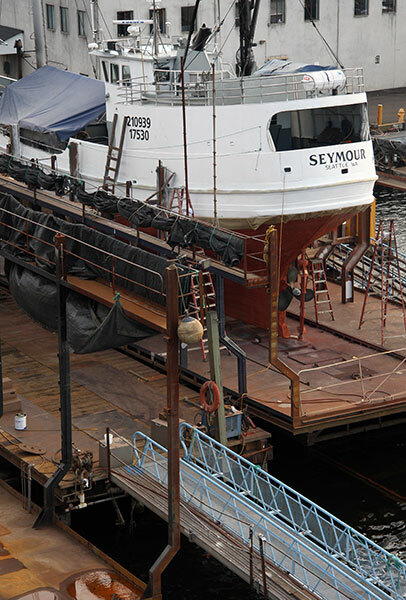 Here, the fishing boat Seymour is pulled out of the water on a wheeled platform running on underwater rails. This was the latest in a whole series of routine repairs and repaints amongst structural changes and the installation of new equipment since her launch in 1913. She is one of some 20 survivors from a fleet of c.150 wood-hulled schooners built in the early 20C. They were used particularly for longline halibut fishing off Alaska. 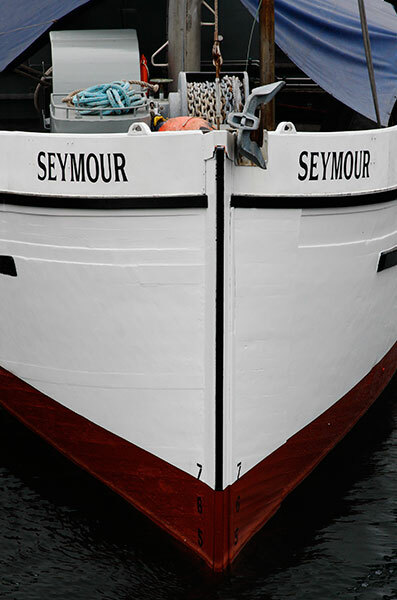 These images of Seymour were made from the narrow sidewalk on Ballard Bridge, a single bascule structure. All manner of traffic speeding past close to one’s elbow was a little unsettling. However, it was a good viewing platform in both directions and the operation to open and close it to shipping was a diversion. I liked the curving lines of this wooden hull and speculated on the number of times it had undergone repair and modernisation. Others such as the Northern and the Vansee appear in following images as does the Zealot, a steel-hulled successor built in 1992. I photographed the Seymour on a visit in 2009, recording her in immaculate condition from a similar overhaul. These are remarkable boats still working efficiently and economically after a century sailing through all manner of weather. The sails have gone, internal combustion engines provide power, wheelhouses have changed, radio, radar and electronic equipment have been added to strong hulls built from local timber. 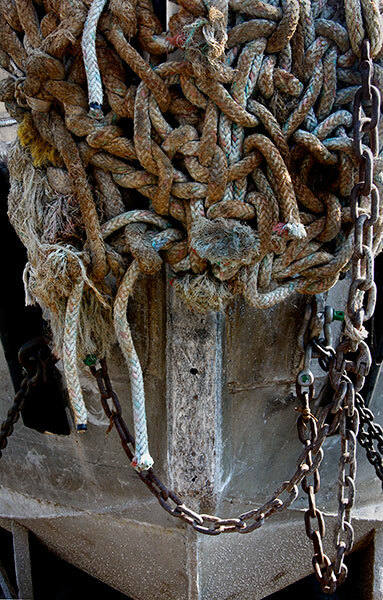 There is an simple beauty in their lines and details whether sailing individually or moored-up together. Close similarity in the hull form and construction are obvious although the superstructures differ. 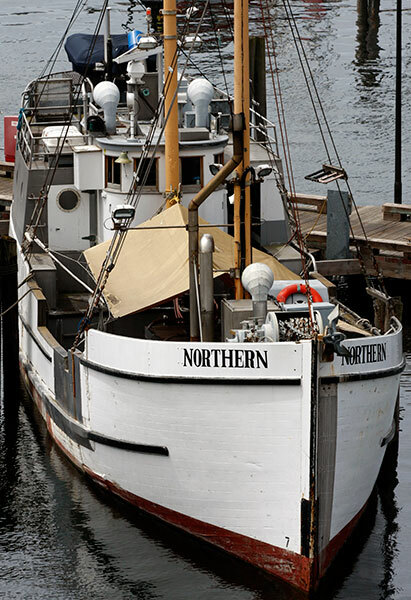 The Northern has twin masts and a perhaps older wheelhouse but some equipment details and the tent awning are close. When built, the line fishermen operated from small dory boats until the practice was superseded by fishing from the main deck in the 1920s. The Vansee was launched in 1913 and measures over eighty feet in length. Beyond, the blue hull of the Zealot can be seen hauled up on one of the three ways in the repair yard. Further off, the southerly Ballard Bridge slip roads carry increasingly dense afternoon traffic. Paint was being stripped from some areas of the hull as part of the overall repainting programme. Here traces of past changes and repairs to the bow planking are visible. I liked the patterning of the exposed wood grain and the strong, shadowed lettering of her name. 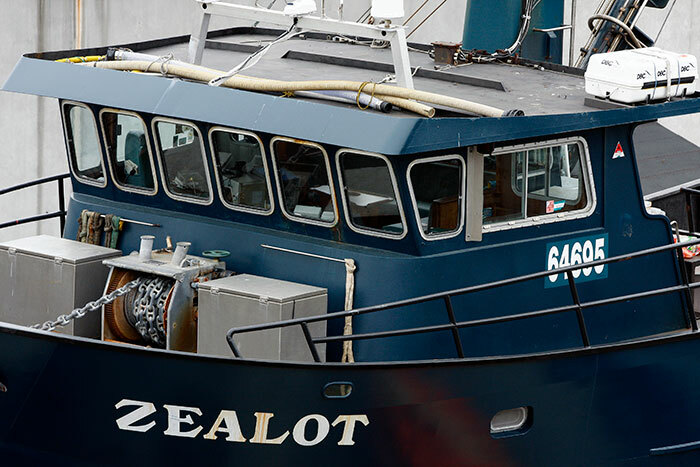 The steel-hulled Zealot was launched in 1992 to a very different aesthetic but looking at the general forms of designs eighty years apart there are common features. Both are very seaworthy boats that are worked in rather than simply sailed through the roughest waves in potentially very hostile seas. 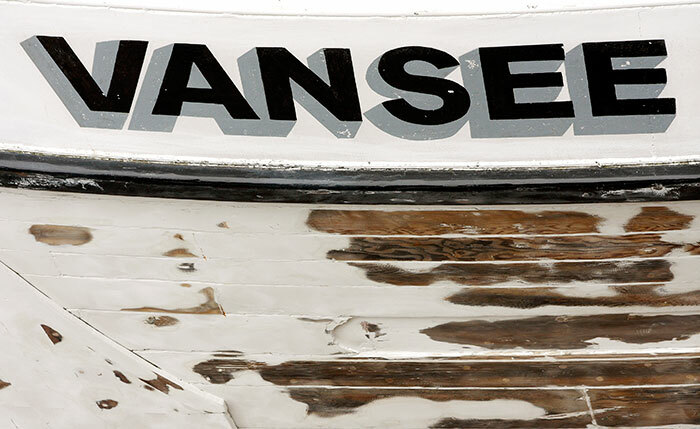 The Vansee appears slimmer in beam and more gently tapered to the bow. One might speculate on differences in handling qualities of the two hulls old and new. 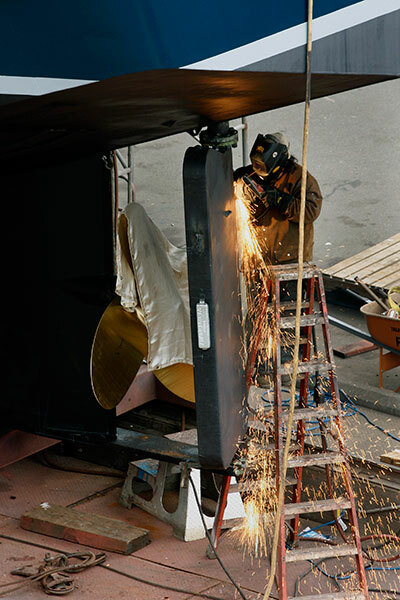 On this visit I was lucky to see welding work underway on the rudder assembly of the Zealot. A tarpaulin provides some protection to part of a seemingly new bronze screw propeller. The pristine vessel’s overhaul seemed complete but I was unable to return to record its relaunch into Salmon Bay. Originally built in 1941 for the United States Navy as a wooden hulled open motor launch, the craft was declared surplus at the end of WW2. Acquired by the Sea Scouts it underwent extensive rebuilding work by them to in a conversion to a gaff rigged ketch. 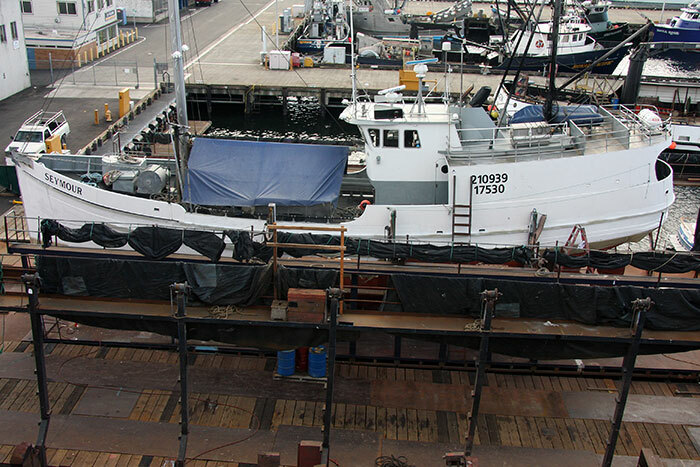 The hull was lengthened to 44 feet, with a keel, deck and deckhouse added. Recommissioning came in 1950. Its elegant lines and immaculate order make for a fine sight at moorings let alone under sail. 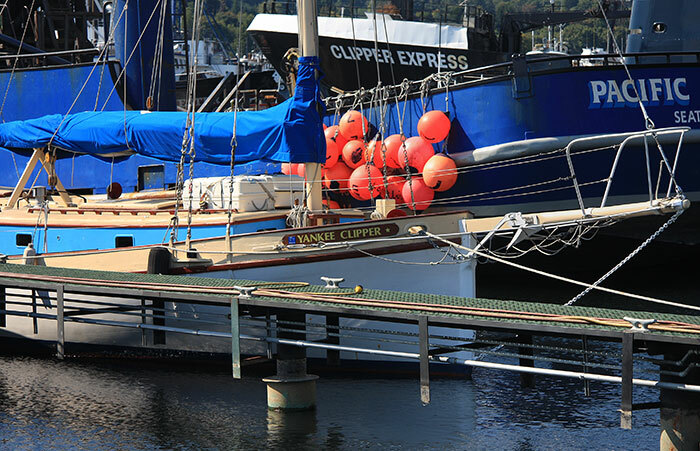 More information on her history and details of its Sea Scout activities are on the Yankee Clipper website. In this image the afternoon sunshine created tones from the white hull through to black in the water reflection of the access gangway. The nearby shipping locks see all manner of commercial and pleasure craft pass through to the open sea. Further east the broad expanses of water in Lakes Union and Washington provide good conditions for sailing boats, scheduled floatplane services and the occasional power boat racing sessions. 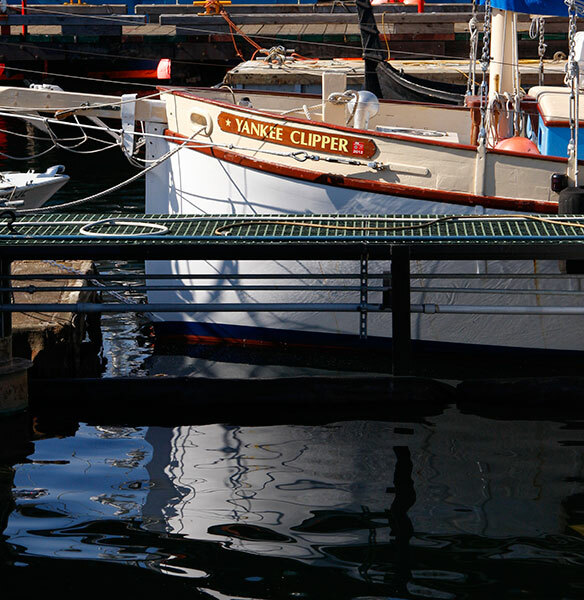 An immaculately painted fishing boat was moored beyond the Yankee Clipper. 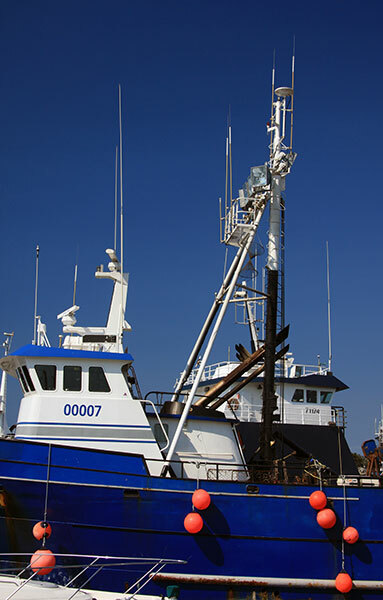 I liked the combination of blue hull and sky cut by geometric shapes in black and white. The red fenders might suggest punctuation marks or a fragment of musical notation. 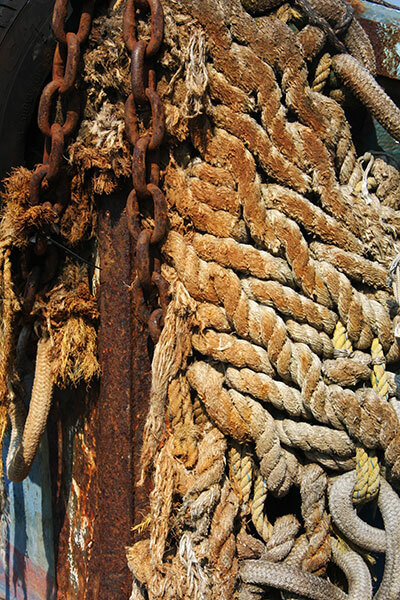 This and the following image were made on the dockside at the Fishermen’s Terminal. The decaying bow fender must have been a fine piece of rope knotting when first fitted to the bow of this open boat. The boat hull and fender on this alloy boat were in better condition that that shown in the previous image. The TALL SHIPS 1 and TALL SHIPS 2 galleries have images of pristine and creative rope work in marked contrast to these. A variety of ships and boats were moored alongside industrial and marina quays on the south shore of Salmon Bay. 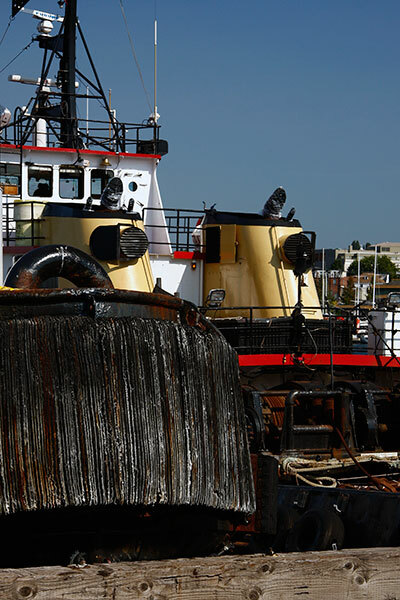 The squat and powerful lines of several tugboats were accessible for photography. Here, the large bow fender of one of them juts over the low timber dockside barrier. 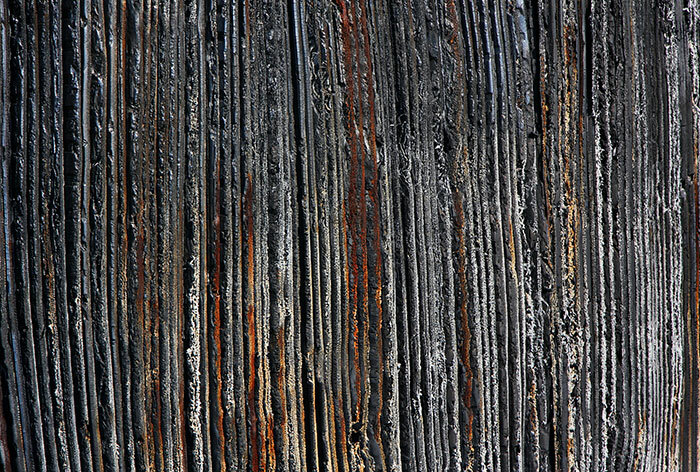 This image frames a detail from the laminated bow fender in Image 15 to show its structure, colours and textures. 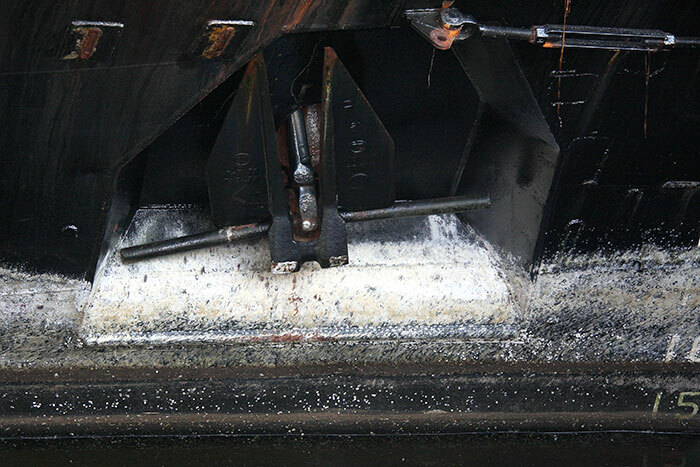 An anchor set low and well back on a tugboat bow. With hindsight I should perhaps have included the whole angled row of hull depth numbers within the frame rather than just the three fragments shown here. 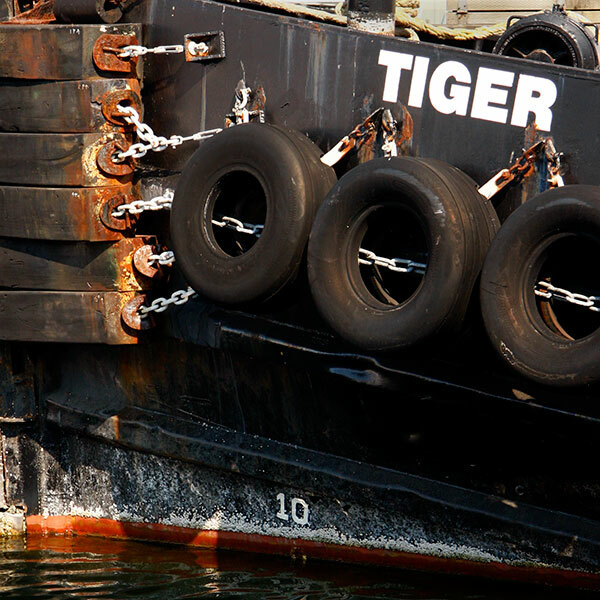 Used vehicle tyres have been adopted as extensions to the heavy strap the bow fenders on the tugboat Tiger.